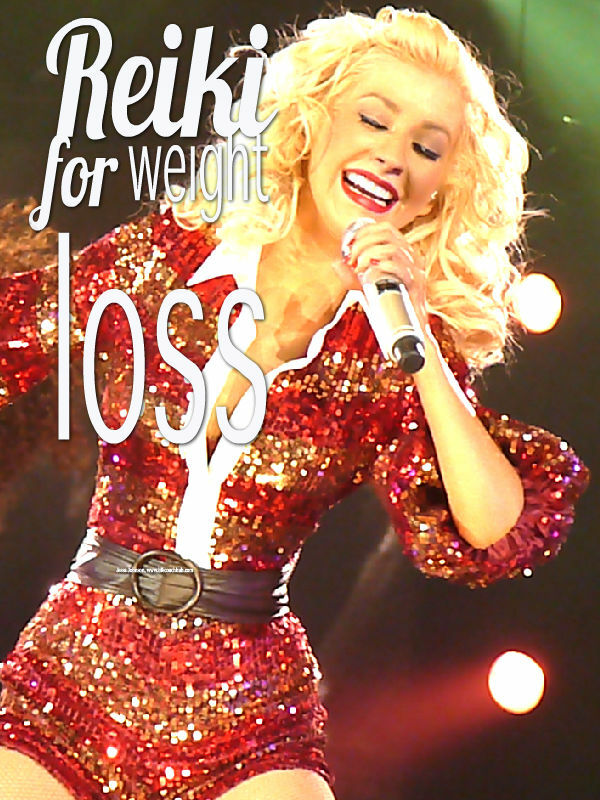 Did you know it's rumored that Christina Aguilera attributes Reiki to helping her lose 30 pounds? The pop star and mother reportedly receives Reiki treatments three times a week. Not everyone can afford Reiki treatments three times a week, but Reiki can be self taught. Everyone can benefit from the reduced stress and emotional grounding Reiki can contribute to weight loss. Reiki is a form of energy work, and is used to balance the different energy fields in the body. When our energy fields are off balance we can start to show different symptoms in the body on a more physical level. Sometimes this can be a result of weight gain, and fat carried around the mid section. Since Reiki helps to balance the energy flow in and around the body, it may be able to help weight loss, and helping assist the body in detoxing. Reiki can assist in stabilizing your appetite and help stop overeating, cravings and emotional eating (eating when life gets stressful instead of dealing with the underlying emotions). Reiki can help you be more aware of your body's nutritional needs. It can help you to make healthier choices and also to remove unhealthy cravings of salty and sugary snacks. Some clients have reported that after only a few sessions of Reiki, they completely changed the way they feed their body. They reported an increase in their will-power too. Reiki can help tune and clear the organs so that they better process the food. It can help take the stress out of making the needed changes. Which can aid in the body detoxing and letting go of all the built up toxins from years of eating unhealthy. In order to lose weight and keep it off you have to adopt a healthier and more active lifestyle. But Reiki can be a wonderful support for you while you do what you need to do to start living a healthier life. Yoga, massage, acupuncture, and the bio mat are other forms of energy work and they work well with Reiki, so you might want to consider adding them into your new healthy lifestyle. Whether your weight problems have a physical or a psychological basis, Reiki will always help a person move towards better health. It is certainly worth a try because Reiki will make you feel better. If you can feel better about yourself first, the weight will come off easier and stay off. It's much easier to walk away from those sugary, fatty foods when you have a deep love for yourself and your body. Some other modalities suggest that the weight is a barrier we put up to protect ourself.. Abuse or trauma from our past can cause us to build a wall around our body to help protect us from further harm. Sometimes we have to let go of built up emotions before the weight will come off. Reiki can help you with this. Sometimes therapy and other professional assistance is needed to fully heal the body, mind and spirit. But Reiki can help you feel more comfortable and confident so that you will be able to let go of this "shield" and help promote the emotional freedom which can lead to weight loss and a healthy body. Reiki is not a quick-fix, but for anyone concerned for their health, it provides a marvelous aid towards healing. Keep in mind, that it takes several sessions or more to really experience good results. Give it a try and a chance, it can only make you feel better... What do you have to lose? ?